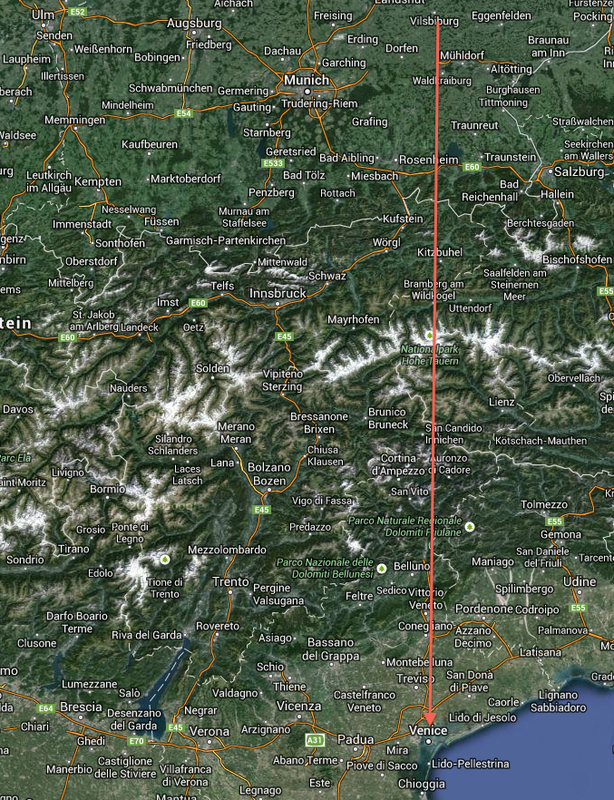 My flight from between Munich and Salzburg over the Alps and Dolomites to Venice. I've been a dedicated WSA (Window Seat Alpinist) for a long time. High peaks can be really dangerous if you actually ascend them. As an elderly gentleman my legs and lungs are not what they used to be. When actually trying to climb the Alps, I shake like maracas and breath harder than Darth Vader. So I figured the most comfy way to enjoy mountains is shooting away pics from a plane. A couple weeks ago I flew from Helsinki to Venice for the first time ever. Although I have been to Venice and travelled around Northern Italy quite extensively, I have never flown to Venice nor seen the Dolomites with my own eyes before. I had better do it now, when I can still see something. It was the usual 3-hour morning flight. I slept the first two hours and woke up when the captain announced we were flying over Bavaria, between Munich (Germany) and Salzburg (Austria). The weather was unstable with clouds, but still ok for taking photographs. I felt happy and lucky now with my window seat in the front. At check-in my iPhone Passbook had been assigned the seat passengers avoid like the plague: by an emergency exit door! Unfortunately that was the only seat left. However I didn't panic. I was going to perform an old WSA-trick. There are usually always some free seats available just before boarding. At the gate I approached the desk and enquired about changing seats. And yippie-kay-yay, a new boarding pass with 3A window seat was printed for me at once! Thank you Finnair! Ladies and gentlemen, without any further ado, let's present the photos now. It's cloudy but ok. Looking East. It's about 9am CET. Lake Chiemsee, Herreninsel Island and Chiemgau Alps in Bavaria, Germany. Chiemgauer100.de will take place around here on July 25-27, 2014. Eastern Alps in Salzburg area, Austria. Kaiser mountains in Northern Limestone Alps, Austria. These peaks are just above 2000m. Durlassboden reservoir at 1405m on Tyrol/Salzburg border in Zillertal valley. Gerloser Seelauf run race goes around it. This is Dolomites for sure. Ok the show is over folks. Landing in Venice soon.